These options provide you a list to choose which module you want to import to or export from and it will take you to the Import/Export menu within the appropriate module. Please have a look at our wiki page on importing contacts to see technical specifics about importing from .csv format. Export converts every bit of data in your X2CRM system into a single .csv file. You can consider this a type of backup if you like, but it’s also useful for easily importing data into another X2CRM installation, say, on your home computer. Please have a look at our wiki page on importing to see technical specifics about importing from .csv format. The modules you can export data from are filterable. Check off the models you want to export the record data from in the list highlighted by the green box. 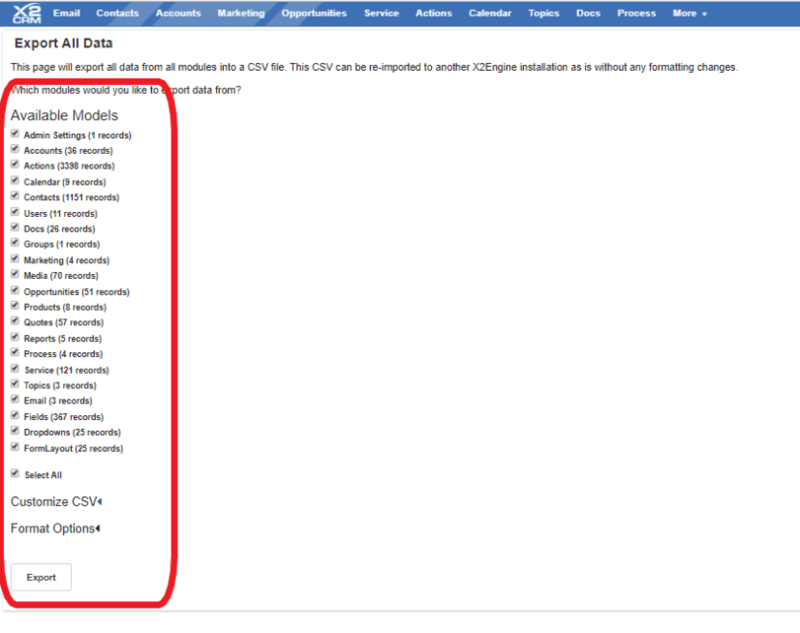 Once you have an X2CRM data .csv file, you can import it to another (or the same, even. Who’s stopping you?) X2CRM installation. The import option asks you if you want to overwrite any existing data or if you want to leave any existing data alone and simply add the import on top of that data. The Tag Manager might more aptly be called the tag deleter. Here you can see an overview of all tags currently used within your X2CRM system. The manager gives you the ability to delete individual or all tags. Individual tags can be deleted by pressing the delete button in the far right column. You may delete all tags via the ominous Delete All button highlighted in the orange box near the bottom of the page. Tags can be created at any time on a contact’s page by double clicking inside the tag field. If you wish to undo an import, you can do so to some degree. With the import manager you can view the date and time an import took place (highlighted in orange) for easy sorting. See the amount of updated records, shown in the column highlighted in blue. When you find the import you want to undo, select the appropriate rollback button, found in the column highlighted in green. The rollback option deletes the records of a particular import. It does not undo any overwriting that import may have done. So, if you unintentionally selected ‘overwrite data’ upon import, you unfortunately cannot reverse that deletion. This is why it is advisable to be cautious when overwriting and importing data, as well as to keep good backups. But then, you probably already knew that. Revert Merges : Revert record merges which users have performed in the app. Mass Dedupe Tool: View a list of all duplicates in the system and resolve them in bulk. Locate Missing Records: View a list of all hidden records of a particular type in the system.